A little while ago I posted a PC build which I was seriously considering, in the end I bought it with a few minor tweaks. 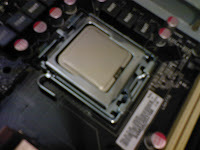 I got a E8400 instead of the E7400 CPU, and the ATI 4870 over the ATI 4850 graphics card. Computer Lounge also gave me a free motherboard upgrade from a P43 chipset to the P45 because they were out of stock. I was very pleased with that, and they are now my favourite shop for computer stuff, absolutely no hassles, they got the order overnight and delivered the next day. I assembled my computer from parts, as this gives you far more control over exactly what components you use and you are able to build precisely the computer you want. Sometimes you can get cheaper package deals but I found that the brands are often “cheaper” and even the same component can come in many “flavours” for example the VanTec 500W power supply comes with a larger 13.5” fan providing a quieter solution, and it has sleeved cabling and easy-clip-on plugs. After you have assembled all your parts and made sure everything is there and in order, you should start reading the instructions. 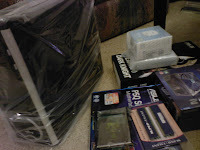 Start with the case, and the motherboard, and move onto the CPU. 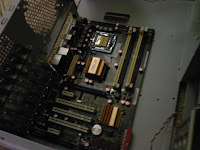 Connect up the motherboard onto the case first (this is the hardest part and will differ significantly depending on your case) Once you have that sorted, stick the CPU and Heat Sink onto the motherboard. 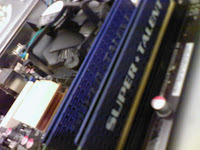 Your CPU should come with a standard Heat Sink. Next if you haven’t already, you will need to hook up all the jumpers and cables from the case onto the motherboard. Once you finish that step, it’s all downhill. 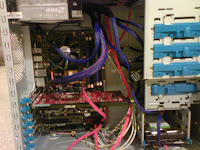 Connect up the RAM, the power supply, the Optical drives and Hard Disk Drives, the Graphics Card. And you’re good to go.